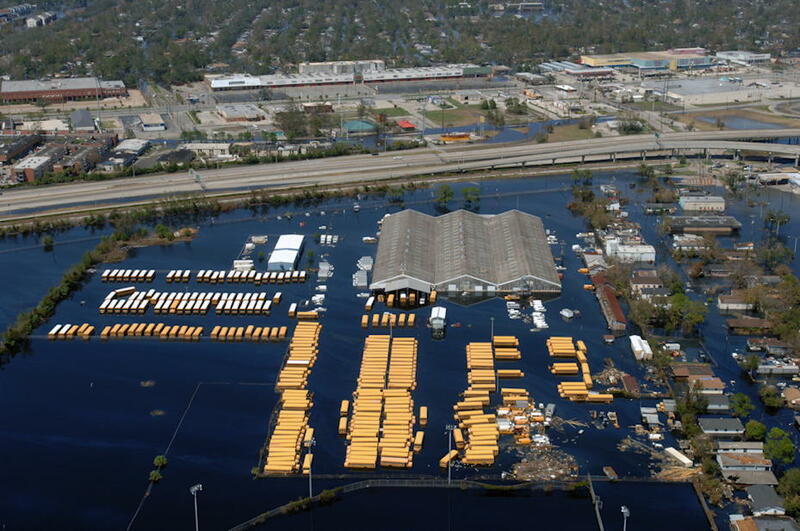 New Orleans disaster evacuation plan: let school buses rust. In Henrico County Virginia in 2005, an iBook sale resulted in an overnight crowd, a mad rush, and several injuries despite rules forbidding camping out overnight—and rules requiring an orderly entrance. In New Orleans, Louisiana in 2005, the Mayor ordered everyone to leave the city before Hurricane Katrina arrived. Despite that, there were 26,000 people remaining to fill the Louisiana Superdome and several elderly women remaining for New Orleans police to harass in their homes and on the street. And in October 2011, Herman Cain got into serious trouble over a gaffe involving whether abortion should be legal or illegal and whose decision it should be. These three incidents all have one thing in common: we, as humans, have a strong desire to believe in magic. We believe that if we say it should be this way, then it will be this way. If we make a law, then the law will be followed. If we add regulations, it doesn’t take any extra work to fill out the compliance forms, and if we create a million new regulations, people will just magically find themselves in compliance. The intersection between abortion and law often delves into magic. Governor Perry capitalized on Cain’s gaffe1 not by pointing out that it’s a gaffe, but by implying that abortion absolutely should be against the law. I hope that Perry is ready for the obvious question from Romney—what should the jail term be for a woman who has an abortion, Rick?—but judging from Perry’s previous debate appearances, I’m not holding my breath. Abortion laws strike at one of the most fundamental mistakes we can make as a society: we should not have rules we are unwilling to enforce. I’m sure we’ve all been in the position where authority figures gave us instructions but didn’t care whether they were followed, neither enforcing the rules nor assisting those who couldn’t for whatever reason follow the rules. It might be waiting in a line, and the moment the doors open everyone swarms around the line. Only people who do the right thing follow the instructions; the rest benefit from lax enforcement, and victimize the sick or elderly who are stuck. We saw the same dynamic in New Orleans that we did in Henrico County. It is always easier to maintain order than it is to restore order that has been lost. For a trivial thing like a $50 computer, it doesn't matter—as long as the poor decisions don’t lead to accidental deaths. But that’s the problem with making rules and not enforcing them: it can turn a trivial situation into a dangerous one. And it can turn a dangerous situation into a deadly one. It is bad and sometimes dangerous to require but not enforce. Laws we’re unwilling to enforce encourage the “lawbreakers” to continue breaking the rules, and it encourages the “law-abiding” to not take part. This is bad at a computer give-away, deadly in an emergency. During the first days following Hurricane Katrina, the press played up the lawlessness in New Orleans as a “Lord of the Flies” affair. Turns out, fortunately, that it wasn’t that bad. But it could have been, and it still wasn’t good. When the Mayor and the Governor told people to leave New Orleans, and did not also assist people in leaving, they pretty much set up the disaster that followed. Without assistance leaving and without an enforced evacuation, the only people who left were those likely to do the right thing who also had the resources to leave. Those who don’t generally do the right thing stayed; and those who didn’t have the resources—the handicapped, the elderly poor, poor in general—stayed. This concentrated both victims and victimizers, prey and predator, together. Apparently, they even had a plan in place to evacuate everyone. They just didn’t use it. They’d been running emergency preparedness dry runs for years, five out of every seven days, spring, winter, and fall, transporting a significant portion of New Orleans’ population to central areas for further instructions. They called that plan “bringing kids to school”: New Orleans’ fleet of school busses was an important part of their emergency evacuation plan, all gassed up and ready to go for the upcoming school year. But they never made use of that plan or those buses2. New Orleans mayor Ray Nagin was acting like those stores that post signs asking you to hand any large bags over to a cashier. Store employees rarely ask that you do so: that would mean taking responsibility for your belongings. A couple of runs of those school busses would not necessarily have evacuated the victimizers, but it would have helped ensure that women abandoned by their ex-husbands wouldn’t have to hide in their attic while looters ransacked their home. By 3:00pm of the 18th Mayor Schmitz had appointed a “Council of Fifty” to oversee the relief operations, had declared martial law, and had promulgated an order to shoot to kill all looters and other serious lawbreakers. It sounds harsh, but looting in 1906 was stopped. Looters in New Orleans had free reign. In the future, more people will ignore evacuation orders because of it: they know the orders aren’t enforced, and they know that their life work is at risk not just from the weather but from looters. The way Gretna was treated in the press for their successful evacuation efforts reminded me of the Ant and the Grasshopper. Gretna planned well; New Orleans did not. This made Gretna a target. Newspapers called it a “mostly white community”. This was true only in the most technical, statistical sense: Gretna’s population is and was multicultural, with whites barely topping 50% at 53.3%. Further, according to the Gretna, Louisiana information page, that 53.3% includes some of the Hispanic population. Gretna is in no sense an all-white community and in no reasonable sense a mostly-white one. We can contrast this with the city of Gretna: their city leaders called for a “mandatory evacuation” and then directed their police to enforce it and allocated the transportation to ensure that everyone could leave. They assisted anyone who couldn’t leave, and they enforced the evacuation order against those who wouldn’t. Their police then did their best to secure the city against looters. You can bet that the people of Gretna are far more likely to follow mandatory evacuation orders if necessary in coming years than the people of New Orleans are. Mark Steyn blames a culture of passivity growing in the United States; I’d argue that it was a culture of passivity among those who stayed and among those in power. Those who were not likely to be passive left when the Mayor said leave. Maybe they made the mistake of not realizing the Mayor was not going to implement the city’s rescue plan for everyone else, but how could they know that? And further, I think that calling it a “culture of passivity” in a very strong sense blames victims who could not leave. If a culture of passivity in New Orleans contributed to the disaster, that culture was among the public officials who told people that they had to leave and then did not help those who could not, nor force those who would not. Some people can’t leave, passive or not. Candidate discusses 2012 platform on talk show. The way that cities have responded to the Occupy movements recently is another example: the occupiers were exempted from laws that every other organizer has to follow, and were allowed to set up mass demonstrations over long periods of time with no permits, including no oversight of sanitation, health, and crime. The result was sexual assault, deaths, and diseases. There were no rapes at tea parties, and no tea partiers shooting at the White House, for example. But we’ve created a culture where city officials feel that it’s okay to exempt one group from the law for political purposes, and this is the result. You see this everywhere once you start looking. You see it in our immigration laws. The system is completely broken. And yet there are still people who try to follow it, people who fall behind because they follow the rules we set up on immigration—which we then ignore in favor of illegal immigration. It’s not just that it isn’t fair, but what it encourages among people who move here: that breaking the law is expected of them. If they don’t break the law, we tie them up in paperwork and indecision. If they break the law, we help them stay. We shouldn’t have laws we aren’t willing to enforce. Or worse, laws we’re willing to let some people bypass but not others. The worst kind of law is one we’re only willing to enforce against some people. You see that in our drug laws, where there are so many offenders that police go after the easy targets; non-violent offenders who are safer to arrest. We saw the same thing in the New Orleans police handling of looters: rather than go after looters, they just grabbed whoever was easiest, such as grandmothers with guns to defend themselves, or an elderly woman walking home with a sausage. In the case of drug laws, this style of enforcement exacerbates—and may even create—the violence of the black market. Detective Jim Lyman said “they’re the nicest people in the world to arrest” of the Grateful Dead fans in Albany. But concentrating enforcement on those who are easy to arrest doesn’t do anything except encourage difficult arrests. The very worst example, however, are our traffic laws. We specifically set laws that everyone who drives safely will break. When we set up enforcement, we design it to increase the number of lawbreakers—more lawbreakers means more money for the city and the state. Speeders are a harvest, and local governments would starve if we lost them. When we set speed limits, we choose limits that criminalize people who drive with the flow of traffic. When we set up red light cameras, we choose short yellow times. We even shorten the yellow times if they’re currently set safely, because red light cameras only pay for themselves if we ensure that people run red lights. Then, once everyone’s breaking the law, the laws are used as excuses to stop people the police want to stop, rather than applied uniformly. Some states, such as California, even exempt public officials from the laws. Selective enforcement creates a fear of government. Even if you don’t deliberately try to evade taxes, you probably get a chill when you receive a communication from the IRS. The tax laws are so complex and so huge that almost everyone breaks them. Even to the point where the current Treasury Secretary—the head of the IRS—broke the law. It’s just a question of who the IRS wants to enforce the laws and regulations against. That includes you or me; it doesn’t include Timothy Geithner. The result is no respect for the law. We should remove any law that we’re not willing to enforce, stop passing laws we’re unwilling to enforce, and uniformly enforce laws we’re unwilling to remove. One teen, realizing his neighborhood was literally drowning, stole a school bus and drove his neighbors out . Dave Schuler takes a look at previous major disasters and compares their success to New Orleans’s failure. Banning abortion in Henrico County, New Orleans last modified November 19th, 2011.